A household refrigerator with its door open. Refrigeration is the process of removing heat from an enclosed space, or from a substance, and rejecting it elsewhere for the primary purpose of lowering the temperature of the space or substance and then maintaining that lower temperature. The term cooling refers generally to any natural or artificial process by which heat is dissipated. The field of study that deals with artificial production of extremely low temperatures is referred to as cryogenics. Cold is the absence of heat, hence in order to decrease a temperature, one "removes heat," rather than "adding cold." To satisfy the Second Law of Thermodynamics, some form of work must be performed when removing heat. This work is traditionally mechanical work, but it can also be done by magnetism, laser, or other means. The use of ice to refrigerate and thus preserve food goes back to prehistoric times. Through the ages, the seasonal harvesting of snow and ice was a regular practice of most of the ancient cultures: Chinese, Hebrews, Greeks, Romans, Persians. Ice and snow were stored in caves or dugouts lined with straw or other insulating materials. The Persians stored ice in pits called yakhchals. Rationing of the ice allowed the preservation of foods over the warm periods. This practice worked well down through the centuries, with icehouses remaining in use into the twentieth century. In the sixteenth century, the discovery of chemical refrigeration was one of the first steps toward artificial means of refrigeration. Sodium nitrate or potassium nitrate, when added to water, lowered the water temperature and created a sort of refrigeration bath for cooling substances. In Italy, such a solution was used to chill wine. During the first half of the nineteenth century, ice harvesting became big business in America. New Englander Frederic Tudor, who became known as the "Ice King," worked on developing better insulation products for the long distance shipment of ice, especially to the tropics. The first known method of artificial refrigeration was demonstrated by William Cullen at the University of Glasgow in Scotland in 1756. Cullen used a pump to create a partial vacuum over a container of diethyl ether, which then boiled, absorbing heat from the surrounding air. The experiment even created a small amount of ice, but had no practical application at that time. In 1805, American inventor Oliver Evans designed but never built a refrigeration system based on the vapor-compression refrigeration cycle rather than chemical solutions or volatile liquids such as ethyl ether. In 1842, an American physician, John Gorrie, designed the first system for refrigerating water to produce ice. He also conceived the idea of using his refrigeration system to cool the air for comfort in homes and hospitals (i.e., air-conditioning). His system compressed air, then partially cooled the hot compressed air with water before allowing it to expand while doing part of the work required to drive the air compressor. That isentropic expansion cooled the air to a temperature low enough to freeze water and produce ice, or to flow "through a pipe for effecting refrigeration otherwise" as stated in his patent granted by the U.S. Patent Office in 1851. Gorrie built a working prototype, but his system was a commercial failure. Alexander Twining began experimenting with vapor-compression refrigeration in 1848 and obtained patents in 1850 and 1853. He is credited with having initiated commercial refrigeration in the United States by 1856. Meanwhile, James Harrison who was born in Scotland and subsequently emigrated to Australia, begun operation of a mechanical ice-making machine in 1851 on the banks of the Barwon River at Rocky Point in Geelong. His first commercial ice-making machine followed in 1854 and his patent for an ether liquid-vapor compression refrigeration system was granted in 1855. Harrison introduced commercial vapor-compression refrigeration to breweries and meat packing houses and by 1861, a dozen of his systems were in operation. Australian, Argentinean and American concerns experimented with refrigerated shipping in the mid 1870s, the first commercial success coming when William Soltau Davidson fitted a compression refrigeration unit to the New Zealand vessel Dunedin in 1882, leading to a meat and dairy boom in Australasia and South America. The first gas absorption refrigeration system using gaseous ammonia dissolved in water (referred to as "aqua ammonia") was developed by Ferdinand Carré of France in 1859 and patented in 1860. Due to the toxicity of ammonia, such systems were not developed for use in homes, but were used to manufacture ice for sale. In the United States, the consumer public at that time still used the ice box with ice brought in from commercial suppliers, many of whom were still harvesting ice and storing it in an icehouse. Thaddeus Lowe, an American balloonist from the Civil War, had experimented over the years with the properties of gases. One of his mainstay enterprises was the high-volume production of hydrogen gas. He also held several patents on ice making machines. His "Compression Ice Machine" would revolutionize the cold storage industry. In 1869 he and other investors purchased an old steamship onto which they loaded one of Lowe’s refrigeration units and began shipping fresh fruit from New York to the Gulf Coast area, and fresh meat from Galveston, Texas back to New York. Because of Lowe’s lack of knowledge about shipping, the business was a costly failure, and it was difficult for the public to get used to the idea of being able to consume meat that had been so long out of the packing house. Domestic mechanical refrigerators became available in the United States around 1911. By the 1870s breweries had become the largest users of commercial refrigeration units, though some still relied on harvested ice. Though the ice-harvesting industry had grown immensely by the turn of the twentieth century, pollution and sewage had begun to creep into natural ice making it a problem in the metropolitan suburbs. Eventually breweries began to complain of tainted ice. This raised demand for more modern and consumer-ready refrigeration and ice-making machines. In 1895 German engineer Carl von Linde set up a large-scale process for the production of liquid air and eventually liquid oxygen for use in safe household refrigerators. Refrigerated railroad cars were introduced in the U.S. in the 1840s for the short-run transportation of dairy products. In 1867 J.B. Sutherland of Detroit, Michigan patented the refrigerator car designed with ice tanks at either end of the car and ventilator flaps near the floor which would create a gravity draft of cold air through the car. By 1900 the meat packing houses of Chicago had adopted ammonia-cycle commercial refrigeration. By 1914 almost every location used artificial refrigeration. The big meat packers, Armour, Swift, and Wilson, had purchased the most expensive units which they installed on train cars and in branch houses and storage facilities in the more remote distribution areas. It was not until the middle of the twentieth century that refrigeration units were designed for installation on tractor-trailer rigs (trucks or lorries). Refrigerated vehicles are used to transport perishable goods, such as frozen foods, fruit and vegetables, and temperature-sensitive chemicals. Most modern refrigerators keep the temperature between -40 and +20 °C and have a maximum payload of around 24 000 kg. gross weight (in Europe). With the invention of synthetic refrigerations based mostly on a chlorofluorocarbon (CFC) chemical, safer refrigerators were possible for home and consumer use. Freon is a trademark of the DuPont Corporation and refers to these CFC, and later hydrochlorofluorocarbon (HCFC) and hydrofluorocarbon (HFC), refrigerants. Developed in the late 1920s, these refrigerants were considered at the time to be less harmful than the commonly used refrigerants of the time, including methyl formate, ammonia, methyl chloride, and sulfur dioxide. The intent was to provide refrigeration equipment for home use without endangering the lives of the occupants. These CFC refrigerants answered that need. As of 1989, CFC-based refrigerant was banned via the Montreal Protocol due to the negative effects it has on the ozone layer. The Montreal Protocol was ratified by most CFC producing and consuming nations in Montreal, Quebec, Canada in September 1987. Greenpeace objected to the ratification because the Montreal Protocol instead ratified the use of HFC refrigeration, which are not ozone depleting but are still powerful global warming gases. Searching for an alternative for home use refrigeration, dkk Scharfenstein (Germany) developed a propane-based CFC as well as an HFC-free refrigerator in 1992 with assistance from Greenpeace. The tenets of the Montreal Protocol were put into effect in the United States via the Clean Air Act legislation in August 1988. The Clean Air Act was further amended in 1990. This was a direct result of a scientific report released in June 1974 by Rowland-Molina, detailing how chlorine in CFC and HCFC refrigerants adversely affected the ozone layer. This report prompted the FDA and EPA to ban CFCs as a propellant in 1978 (50 percent of CFC use at that time was for aerosol can propellant). In January 1992, the EPA required that refrigerant be recovered from all automotive air conditioning systems during system service. In July 1992, the EPA made illegal the venting of CFC and HCFC refrigerants. In June 1993, the EPA required that major leaks in refrigeration systems be fixed within 30 days. A major leak was defined as a leak rate that would equal 35% of the total refrigerant charge of the system (for industrial and commercial refrigerant systems), or 15% of the total refrigerant charge of the system (for all other large refrigerant systems), if that leak were to proceed for an entire year. In July 1993, the EPA instituted the Safe Disposal Requirements, requiring that all refrigerant systems be evacuated prior to retirement or disposal (no matter the size of the system), and putting the onus on the last person in the disposal chain to ensure that the refrigerant was properly captured. In August 1993, the EPA implemented reclamation requirements for refrigerant. If a refrigerant is to change ownership, it must be processed and tested to comply with the American Refrigeration Institute (ARI) standard 700-1993 (now ARI standard 700-1995) requirements for refrigerant purity. In November 1993, the EPA required that all refrigerant recovery equipment meet the standards of ARI 740-1993. In November 1995, the EPA also restricted the venting of HFC refrigerants. These contain no chlorine that can damage the ozone layer (and thus have an ODP (Ozone Depletion Potential) of zero), but still have a high global warming potential. In December 1995, CFC refrigerant importation and production in the U.S. was banned. It is currently planned to ban all HCFC refrigerant importation and production in the year 2030, although that will likely be accelerated. Probably the most widely-used current applications of refrigeration are for the air-conditioning of private homes and public buildings, and the refrigeration of foodstuffs in homes, restaurants and large storage warehouses. The use of refrigerators in our kitchens for the storage of fruits and vegetables has allowed us to add fresh salads to our diets year round, and to store fish and meats safely for long periods. In commerce and manufacturing, there are many uses for refrigeration. Refrigeration is used to liquefy gases like oxygen, nitrogen, propane and methane for example. In compressed air purification, it is used to condense water vapor from compressed air to reduce its moisture content. In oil refineries, chemical plants, and petrochemical plants, refrigeration is used to maintain certain processes at their required low temperatures (for example, in the alkylation of butenes and butane to produce a high octane gasoline component). Metal workers use refrigeration to temper steel and cutlery. In transporting temperature-sensitive foodstuffs and other materials by trucks, trains, airplanes and sea-going vessels, refrigeration is a necessity. One of the most influential uses of refrigeration was in the development of the sushi/sashimi industry in Japan. Prior to the discovery of refrigeration, many sushi connoisseurs suffered great morbidity and mortality from diseases such as hepatitis A. However the dangers of unrefrigerated sashimi was not brought to light for decades due to the lack of research and healthcare distribution across rural Japan. Around mid-century, the Zojirushi corporation based in Kyoto made breakthroughs in refrigerator designs making refrigerators cheaper and more accessible for restaurant proprietors and the general public. Methods of refrigeration can be classified as non-cyclic, cyclic and thermoelectric. In these methods, refrigeration can be accomplished by melting ice or by subliming dry ice. These methods are used for small-scale refrigeration such as in laboratories and workshops, or in portable coolers. Ice owes its effectiveness as a cooling agent to its constant melting point of 0 °C (32 °F). In order to melt, ice must absorb 333.55 kJ/kg (approx. 144 Btu/lb) of heat. Foodstuffs maintained at this temperature or slightly above have an increased storage life. Solid carbon dioxide, known as dry ice, is used also as a refrigerant. Having no liquid phase at normal atmospheric pressure, it sublimes directly from the solid to vapor phase at a temperature of -78.5 °C (-109.3 °F). Dry ice is effective for maintaining products at low temperatures during the period of sublimation. A refrigeration cycle describes the changes that take place in the refrigerant as it alternately absorbs and rejects heat as it circulates through a refrigerator. It is also applied to HVACR work, when describing the "process" of refrigerant flow through an HVACR unit, whether it is a packaged or split system. Heat naturally flows from hot to cold. Work is applied to cool a living space or storage volume by pumping heat from a lower temperature heat source into a higher temperature heat sink. Insulation is used to reduce the work and energy required to achieve and maintain a lower temperature in the cooled space. The operating principle of the refrigeration cycle was described mathematically by Sadi Carnot in 1824 as a heat engine. The most common types of refrigeration systems use the reverse-Rankine vapor-compression refrigeration cycle although absorption heat pumps are used in a minority of applications. The thermodynamics of the cycle can be analyzed on a diagram as shown in Figure 2. 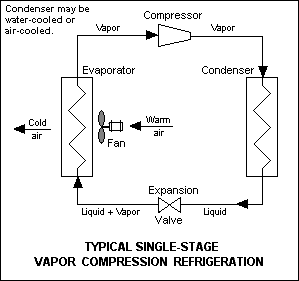 In this cycle, a circulating refrigerant such as Freon enters the compressor as a vapor. 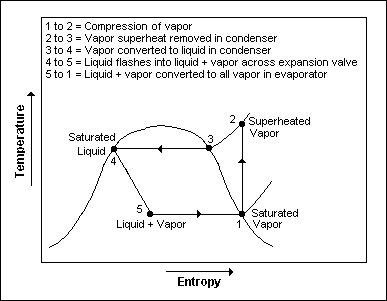 From point 1 to point 2, the vapor is compressed at constant entropy and exits the compressor superheated. From point 2 to point 3 and on to point 4, the superheated vapor travels through the condenser which first cools and removes the superheat and then condenses the vapor into a liquid by removing additional heat at constant pressure and temperature. Between points 4 and 5, the liquid refrigerant goes through the expansion valve (also called a throttle valve) where its pressure abruptly decreases, causing flash evaporation and auto-refrigeration of, typically, less than half of the liquid. More information about the design and performance of vapor-compression refrigeration systems is available in the classic "Perry's Chemical Engineers' Handbook". In the early years of the twentieth century, the vapor absorption cycle using water-ammonia systems was popular and widely used but, after the development of the vapor compression cycle, it lost much of its importance because of its low coefficient of performance (about one fifth of that of the vapor compression cycle). Nowadays, the vapor absorption cycle is used only where waste heat is available, where heat is derived from solar collectors, or electricity is unavailable. The gas cycle is less efficient than the vapor compression cycle because the gas cycle works on the reverse Brayton cycle instead of the reverse Rankine cycle. As such the working fluid does not receive and reject heat at constant temperature. In the gas cycle, the refrigeration effect is equal to the product of the specific heat of the gas and the rise in temperature of the gas in the low temperature side. Therefore, for the same cooling load, a gas refrigeration cycle will require a large mass flow rate and would be bulky. Because of their lower efficiency and larger bulk, air cycle coolers are not often used nowadays in terrestrial cooling devices. The air cycle machine is very common, however, on gas turbine-powered jet aircraft because compressed air is readily available from the engines' compressor sections. These jet aircraft's cooling and ventilation units also serve the purpose of pressurizing the aircraft. Thermoelectric cooling uses the Peltier effect to create a heat flux between the junction of two different types of materials. This effect is commonly used in camping and portable coolers and for cooling electronic components and small instruments. Because few materials exhibit the required properties at room temperature, applications have so far been limited to cryogenics and research. Other methods of refrigeration include the air cycle machine used in aircraft; the vortex tube used for spot cooling, when compressed air is available; and thermoacoustic refrigeration using sound waves in a pressurized gas to drive heat transfer and heat exchange. A much less common definition is: 1 tonne of refrigeration is the rate of heat removal required to freeze a metric ton (i.e., 1000 kg) of water at 0 °C in 24 hours. Based on the heat of fusion being 333.55 kJ/kg, 1 tonne of refrigeration = 13,898 kJ/h = 3.861 kW. As can be seen, 1 tonne of refrigeration is 10% larger than 1 ton of refrigeration. Most residential air conditioning units range in capacity from about 1 to 5 tons of refrigeration. ↑ Air conditioning and refrigeration chronology. ASHRAE.org. Retrieved August 4, 2008. ↑ The Advent of Mechanical Refrigeration Alters Daily Life and National Economies Throughout the World. Science and Its Times: 1800-1899. Retrieved August 4, 2008. ↑ Aubrey F. Burstall, 1965. A History of Mechanical Engineering. (Cambridge, MA: The MIT Press. ISBN 026252001X). ↑ Improved process for the artificial production of ice. US Patent Office, Patent 8080, 1851. Retrieved August 4, 2008. ↑ Modern Marvels History of the refrigerator.history.com. Retrieved August 4, 2008. ↑ Mario J. Molina, and F. S. Rowland. 1974. Stratospheric sink for chlorofluoromethanes: chlorine atom-catalysed destruction of ozone. Nature 249:810-812, 28. ↑ Linda Manning. 2001. The Ideal Vapor-Compression Cycle. University of Nevada. Retrieved August 4, 2008. ↑ R.H. Perry, and D.W. Green. 1984. Perry's Chemical Engineers' Handbook, 6th ed. (New York, NY: McGraw Hill, Inc. ISBN 0070494797), 12-27 through 12-38. ↑ Guide To SI Units. NIST. Retrieved August 4, 2008. Althouse, Andrew D., Carl H. Turnquist, and Alfred F. Bracciano. 2003. Modern Refrigeration and Air Conditioning, 18th Edition. Tinley Park, IL: Goodheart-Wilcox Publishing. ISBN 1590702808. Anderson, Oscar Edward. 1972. Refrigeration in America: A history of a new technology and its impact. Princeton, NJ: Kennikat Press. ISBN 0804616213. Burstall, Aubrey F. 1965. A History of Mechanical Engineering. Cambridge, MA: The MIT Press. ISBN 026252001X. Mathur, M.L., and F.S. Mehta. 1986. Thermodynamics and heat power engineering : in MKS and SI units. New Delhi: Jain. Molina, Mario J., and F. S. Rowland. 1974. Stratospheric sink for chlorofluoromethanes: chlorine atom-catalysed destruction of ozone. Nature 249:810-812, 28. Perry, R.H., and D.W. Green. 1984. Perry's Chemical Engineers' Handbook, 6th ed. New York, NY: McGraw Hill, Inc. ISBN 0070494797. Shachtman, Tom. 2000. Absolute Zero: And the Conquest of Cold. Boston, MA: Houghton Mifflin Co. ISBN 0618082395. Stoecker, W.F., and J.W. Jones. 1982. Refrigeration and Air Conditioning. New York, NY: McGraw Hill Publishers. ISBN 9780070616196. Woolrich, Willis Raymond. 1967. The men who created cold: A history of refrigeration. New York, NY: Exposition Press. 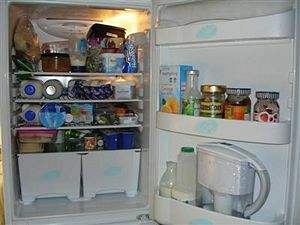 "How Refrigerators Work," from HowStuffWorks. The Institute of Refrigeration UK. This page was last modified on 7 July 2015, at 19:54.